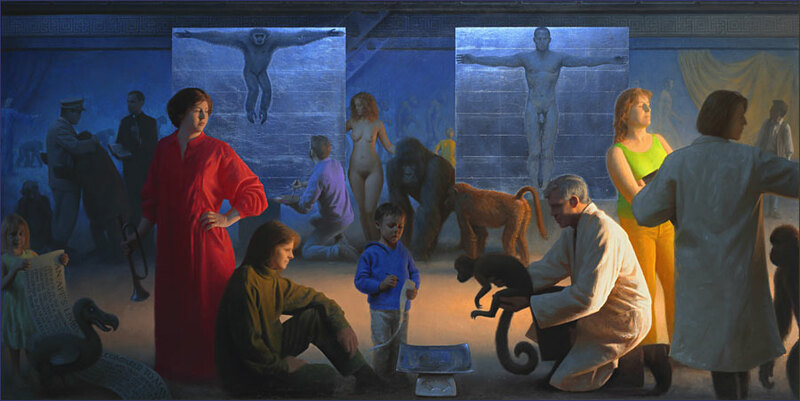 This painting is based on an illustration in an old book on primates comparing the proportions of a human and a gibbon. 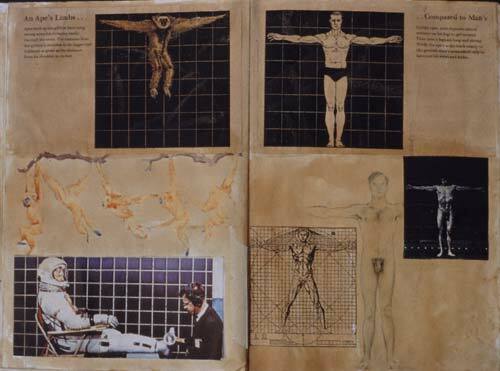 The illustration intrigued me because it quotes the image of Vitruvian Man made famous by Leonardo, in which man's beauty and perfection of form are demonstrated by him fitting, arms outstretched, within a square. The poor gibbon is obviously deficient within this scheme of values: legs dangling, he appears crucified. The illustration seemed to express unintentionally something strange and dysfunctional in our relationship with nature. I sought to fulfil the iconographic potential of the image by translating it into a dramatically lit three-dimensional space, a sort of Last-Judgement scene in which, instead of human souls, animals are weighed and measured and man appears god-like, glorified. In the background the evolution of ape to man progresses toward an unknown future. By overlaying the iconography of science and progress upon older traditions of Christian and classical humanistic iconography, the picture condenses many of the central themes of western civilisation. The result is like a super-history-painting which parodies Christianity, Humanism, and Scientism without, I think, endorsing any of them. I think this reflects my own ambivalence about much of our cultural heritage and likely destiny. The people in the painting are not really free agents: they enact roles not of their choosing but dictated by my iconographic scheme. However, as realistic, sensitive portraits - mostly of friends and family - I think they help to counterbalance the abstractness of the 'big picture' themes (Man, Nature, Science, Destiny) with more intimate human values. In its composition, rich colours and dramatic light, the picture recalls High-Renaissance religious and narrative painting. I also looked to Last Judgement scenes, where Christ 'in glory' is depicted centrally while angels weigh the souls of the dead, separating the righteous from the damned. The imaginary space was inspired by Courbet's Atelier in the Musée D'Orsay in which he depicted himself at his easel in a vast urban studio, surrounded by friends and enemies. I was also thinking of Gauguin's great painting, Where Do We Come From? What Are We? Where Are We Going? and wanted to paint a picture that might live up to the ambition of his title.